Chris & Christie married on Saturday, September 17th, 2016 at the rustic Common Ground Center in Starksboro, VT. 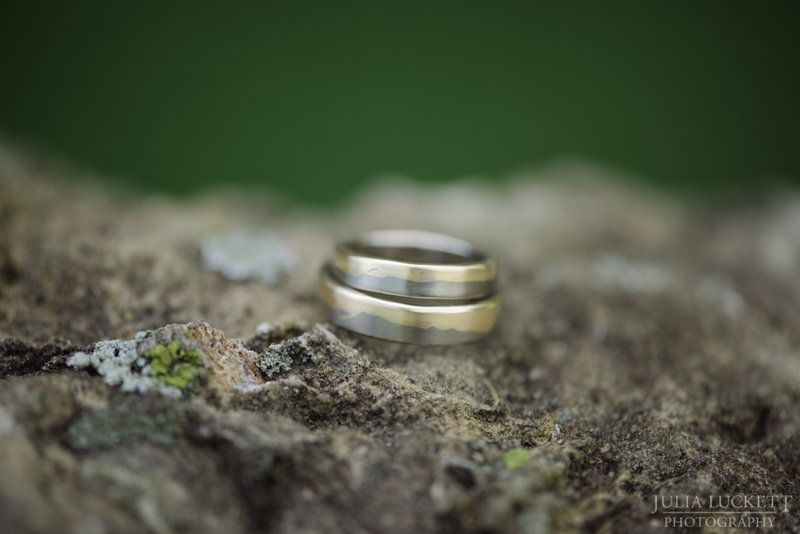 Elegant and effective, Chris & Christie's wedding bands feature the iconic Vermont skyline of Mount Mansfield, which they view from their home. The wedding was filled with personal touches and sincere smiles. "The most beautiful moment for me was the minute we included in our ceremony to just look out and around at the community we had gathered there. We held silence for one full minute, and I tried to make eye contact with each of my friends and family members, as well as Chris's. The love I felt being sent out to us was palpable, as I knew that each of them was blessing our wedding in that moment, in their own ways. I knew that I had all of their support, this day, and all days to come, no matter what. The couple also invited me to join them for the Rehearsal Dinner, which included wood-fired pizza, s'mores and songs by firelight under a bright moon. It was a celebration of love, teamwork and joy.